Emerald Bay offers 2 pools, clubhouse with workout room and tennis courts. Ground floor. NON-Smoking. Queen size bed in the master, full-size bed in the second bedroom. 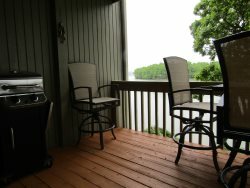 Includes microwave, washer/dryer, dishwasher, 3 TVS/VCR/Cable, small stereo, small jetted bathtub, and a gas grill on the lakeside balcony. Unit offers 12X32 boat slip for an additional fee. Emerald Bay is located down Horseshoe Bend by land and is on the 14 Mile Marker by water. This puts you in the middle of all the Lake action! Emerald Bay offers 2 pools, clubhouse with workout room, and tennis courts with basketball hoop.. The staff was super friendly and extremely helpful. They helped us work through all of our questions and concerns quickly and went out of their way to ensure we had a great stay. The young lady in the office was awesome and extremely helpful. Very nice. Well decorated and a very nice size and the view was great.